What is a Public Safety DAS? A public safety distributed antenna system (DAS) is typically installed inside buildings and large public venues. Public safety DAS is on a different frequency than cellular DAS and is intended for first responders to communicate over their radios without interruption. Most structures built with concrete block, steel or dense material, experience issues with cellular phone signal, and also with first responders radios. 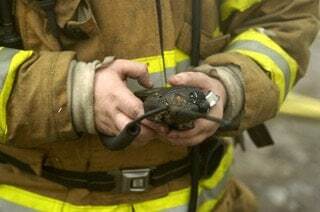 This can and has caused major issues when first responders were simply not able to communicate. Since 9/11 there has been a major push to streamline standards in how public safety DAS are to be installed, commissioned and signed off by the Authority Having Jurisdiction (AHJ). A public Safety DAS consists of a series of donor (outside) antennas that are mounted on the roof to a mast attached to the building. Coaxial cable is then brought in to the building and terminated and grounded. A repeater, which is also referred to as bi-directional amplifiers (BDA), is then mounted in the customers telephone or IDF closet, either in a 19” rack or to the wall. Coaxial cable is then attached to both the repeater and the donor antenna on the roof. Coaxial cables are then ran from the service port to a series of service antennas as called for in the iBwave design. The BDA must then be attached to a back-up battery system that provides a minimum back-up of 12 hours. Please note that some jurisdictions require 24 hour back up, so please check with your Authority Having Jurisdiction. Once this is complete the system is then turned on, commissioned and tested. The repeater or bi-directional amplifier (BDA) is the brains of the distributed antenna system (DAS). Once powered on and set to the right frequencies, the repeater re-broadcasts the outside signal and the repeater then boosts the signal in the building via the server antennas. There are two types of repeaters or bi-directional amplifiers. The first is a channelized repeater that allows the Authority Having Jurisdiction to decide which frequencies can be used and which ones can be turned off. The second type of repeater is non-channelized. This repeater does not allow for the AHJ to pick the frequencies needed or shut down the others not being used. This repeater will re-broadcast all of the public safety frequencies in the 800 MHz -850 KHz simultaneously. New rules and regulations are starting to demand only channelized repeaters can be used going forward. The repeaters also must be painted RED to help the first responders to locate the equipment if needed. For larger facilities, a fiber public safety distributed antenna system is required. In the past, before the fiber equipment was manufactured, multiple repeaters or bi-directional amplifiers were used to cover larger facilities. This can and has caused problems with high noise floors and oscillation that distort the signal and not allow proper transmission. With the new fiber systems, only one repeater is required and is connected to a fiber DAS system that transport the RF signal to one or more fiber remotes. This system distributes the signal more evenly and reduces high noise floors, oscillation and other issues than can cause problems on the network. Give us a call at (813) 343-2334 or fill out a form on our website at boostpoorsignal.com to learn more. Help us get viral. Please share.